Authors these days have to have a “platform”, which basically means a blog, social media presence, things like that. And if I’m being honest, this is the hardest part for me. I sucked at selling Girl Scout cookies, so selling myself is even harder. Some of the advice given to people who are creating platforms talks about “curation”, about talking about only a few topics, about having a consistent look across all platforms. Some of that makes sense. And some of it….doesn’t. When you read what I write here, I hope it comes across as authentic. I hope it comes across like we’re talking over coffee or something. I share, because I want to, and I share all the things I like, not just things in a few topics. My IG feed lately has been yarn and books and flowers, because I love those things, but sometimes I take silly pictures of stuffed Darth Vaders at Hallmark, because it makes me laugh. I want to be real. This is how I am. I want to think that if you met me in person, you’d know me; you wouldn’t be shocked to find out how I feel about being Catholic, or that I love kids, or that I am a Jane Fan Girl, or that I love hockey. I don’t want to worry about curating myself on social media. I want to show you what’s real. That doesn’t mean I share everything, because the Internet is not my diary, guys. :) But I do try to show the good and the bad, because a big part of what I do is tied into health stuff—and I want to show you what that is, reasonably. I don’t blog about every single doctor appointment I have. I don’t IG selfies of myself in a waiting room or in surgery waiting, because to me, that’s sort of private. But I’ll certainly write about it later. I won’t share everything about my life, that’s for sure. Because, you know, privacy is cool. But at the same time, I want to be authentic with my readers. And that means talking about all sorts of things, not just what I want to “curate”. I know, cheerful. But necessary. November is the month of the holy souls, so be sure to remember all those you know who have died in your prayers. Also remember to pray for the holy souls in purgatory! And All Saints’ Day is a Holy Day of Obligation in the U.S. So go to Mass tonight or tomorrow, U.S. Catholics! St. Dominic (detail) from Fra Angelico’s The Mocking of Christ with the Virgin and St. Dominic. The “First order” is the friars and brothers—they are priests, or “cooperator brothers”. The “second order” is the cloistered nuns, who live in monasteries. Yes. Monasteries for nuns. The “third order” is the laity and the sisters (the sisters live in convents. Nuns are cloistered, which means they don’t go out of their monastery without a good reason and permission. Sisters aren’t enclosed.). Dominican sisters in the U.S. are involved in many ministries. Now, third order laity members don’t look different than anyone else. We don’t wear a habit or any sort of insignia regularly. (Alas!) We can wear a medal of St. Dominic or another Dominican saint if we want, or a pin that has the shield of the order. But we don’t look any different than anyone else. We make promises, not vows. They’re not binding under pain of sin, but we do take them seriously. A “day in the life” of a lay Dominican actually depends on the person! It can look radically different for everyone. The rule of life for Dominicans is very flexible and allows for a lot of adaptation, which is one of its strengths. Prayer is—well, prayer. A lay Dominican prays lauds and vespers from the liturgy of the hours and says a daily rosary. She attends Mass as often as she can, and attends confession frequently. A yearly retreat is a good idea. You’re taught how to pray the liturgy of the hours in your chapter meetings (at least I was), and you can use either the books of the breviary, or an app—whatever works better for you. Since Our Lady gave the rosary to St. Dominic, of course we are devoted to it! :) We try to say one set of mysteries—five decades—a day. If you can do more, great! So, how does that look in my day? I say lauds, generally, right when I get up. I go downstairs, start the coffee, and start lauds. When I was working I said lauds at my desk before the workday began. I say vespers around 5:00—if I’m going out to eat, or have evening activities, it’ll be later, whenever I get home. The rosary I try to say right after vespers, but if that’s not possible, then I say it before I go to bed. My love of the rosary was an early sign of a Dominican vocation. It’s long been my favorite way to pray! Statue of St. Dominic on the motherhouse campus of the Dominican Sister of St. Cecilia, Nashville, TN. In the above statue, you see St. Dominic holding a book. Study is key to the life of all Dominicans—St. Dominic wanted his family to preach the faith fearlessly. But to do that, they had to know the faith! That meant study. Even today you will find many friars assigned to universities around the world, where they interact with students and teach theology classes. Preaching is at the heart of the Dominican life—the holy preaching of the truth (“Veritas”) of Christ. St. Albert the Great, a Dominican, gave us the scientific method. The “angelic doctor” of the Church, one of its mightiest theologians, is St. Thomas Aquinas, also a Dominican. But that doesn’t mean that you have to be a genius to be a Dominican. Blessed Margaret of Costello was blind and abandoned by her parents. What you have to have is a love of study and sacred truth. This can mean daily bible reading, reading spiritual works, taking theology classes—whatever suits your interest. Sometimes chapters will study something together. But to be a Dominican, you have to love to read. How do I do this? I’m generally always reading at least one spiritual book. I’m working on building the habit of daily bible reading (lectio divina). I love to read spiritual books and look forward to talking about them with my friends or writing about them here. You don’t have to read St. Thomas’ Summa. You can read “popular” theologians, like Scott Hahn or Bishop Barron’s writings. If you want, you can read the Summa! You can dive as deeply as you want. But you should always be learning more about the faith. Community doesn’t really always play a part in daily life—there are monthly/regular chapter meetings (every chapter varies, I think most meet once a month), but in daily life, there’s not a whole lot of contact. Certainly I have Dominican friends, including the friars that I personally know, but this isn’t an area where I have consistent daily contact. Some people probably do. For the friars, sisters, and nuns, of course, community is daily; it’s how they live. Apostolate is “contemplating and sharing the fruits of contemplation”—a twist on St. Thomas’s saying (one of the mottoes of the order: “to contemplate and share with others the fruit of our contemplation.”) My blog is one of my apostolates; I write about the things I discover in prayer and study. The Catholic 101 series and the resulting book are fruits of my study, prayer, and Dominican vocation! Some Dominicans I know are hospital chaplains; others are CCD teachers, work in homeless shelters, or make rosaries. There are as many apostolates as there are Dominicans. Mine tends to be more on the writing end, so it’s pretty daily for me. I write blog posts, or essays for Take Up & Read, or work on manuscripts that have to do with Christ and the Church. That’s my apostolate. To sum up: A Day in the Life of a Lay Dominican is drastically different for every one of us, but it’s always rooted in prayer and study, finds support in community, and brings forth fruit in the apostolate of each member. Here are links to the Lay Dominican provinces in the U.S.
Do you have any questions? Send them to me in the comments! It’s Monday. You’re dragging into your coffee. The week unfurls in front of you. 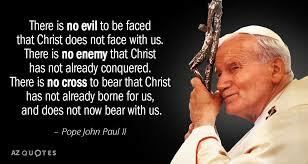 Let St. John Paul II do it! Today’s his feast day! Seriously, who would get mad at this guy? One of the things I hate about mental health issues is that it’s so easy to freak out when you feel yourself starting to slide. It’s so gradual, that it can be just a few little things, and then suddenly you have a day like I had today, where if the World’s Cutest Corgis came into my yard, I would’ve flown into murderous rage. I was so unhinged all day, and if I had to pinpoint it, it would’ve started on Sunday, when I go so angry at the Steelers that I was yelling and swearing and generally losing it. But today, when I wanted to bite the head off any human being I encountered, including my super sweet and wonderful boss, I started to think, waaaaait a minute….. I ran through the regular triggers. I’d been sleeping amazingly. So that wasn’t it. I had some dark chocolate in the house and had a piece of “emergency chocolate.” Nope. Wait a minute…..maybe it’s……the skin cancer med. Now, just knowing that I’m not going crazy—literally—is very helpful. But in the all and all, I’d rather have physical side effects, because then you can take something. Nausea? Vomiting? Phenergan! Pain? We got stuff for that! Can’t sleep! Meds! This, nothing I can do except ride it out until Halloween when the course is finished. I’m already on anti-anxiety meds (since I was 16), so….can’t do anything about that, and even if I wasn’t, it can take awhile for the meds to build up in the system, so it wouldn’t really help, most likely. So, while the med is just a cream, apparently it’s tres potent, and after not even a week….oh well. I adore Jenny Colgan books. They take place in England/Scotland, and they are just so snuggly. I mean, who else writes about a character who has a PUFFIN for a pet? Seriously, people. And there are recipes in each book. So when I was having a GRUMPTASTIC day, I realized there was a new Jenny Colgan book out. I went and got it. And made tea. Reading Jenny Colgan makes days better. Any day. As I’ve written about before, I’m really susceptible to skin cancer. Not just because I’m fair, but because of the meds I’m on. The anti-rejection meds I take make me 10 times more likely than the general population to get skin cancer. So even though I am vigilant about sunscreen, and always have been, now I have to be even more vigilant. The two I have at the moment are, thankfully, easy to treat. One of them is on my tricep, and it’s superficial, so we’re treating it with a special cream. It’s twice a day, for twenty one days, so it’s not a bad course, especially not compared to the IV courses I’ve done that are that long (or longer). I don’t have an IV in, and I’m free to bathe when I want. :) So this is cake. The second one is on my right ear, on the top curve. FORTUNATELY this is also pretty superficial, so we’re just going to scrape it and laser it off. This is easy, but it does require a lot of waiting room time, because you have to wait three hours between scrape and laser. So, that means books to read! But enough about me—let’s talk about you. Please, if you haven’t, go to a dermatologist and get a full body check. If you’re a normal person you probably only need to do this yearly. But please do it. The grandfather of a dear friend has skin cancer and it’s metastasized. Skin cancer kills people. Wear sunscreen. Cover up. Get your skin checked. For the love of God, do not lay out! It’s terrible for your skin, and your vanity. ;-) You want to look younger longer? Don’t tan. So, that’s this week’s medical adventure. It was really too hot to spend much time in the garden, but I did manage to get out after breakfast on Saturday and take photos of the roses, and spend some time in the little replica Lourdes Grotto. Isn’t the statue of Our Lady of Lourdes gorgeous? There’s a tiny bench in there, so you can sit and pray, and a little water feature to represent the spring at Lourdes, so there’s the peaceful bubbling sound of water as well. It’s so pretty, and I just wanted to share it with you. Don’t forget to pick up your copy of Flourish, the new Take Up & Read study on the book of Romans! I went on retreat last weekend, and usually I write up my retreat notes here, so I think I’ll do that over the next few days. But also continuing with the journal entries, I was SUPER grateful for a desk fan in my room. The retreat center was built in the 1950s, and in the “old” part, there is no A/C. In the “new” wing, there is air conditioning. Now, normally this isn’t an issue, because all the rooms have windows that open, so I figured I wouldn’t specifically request a room with A/C, because, it’s October. I should’ve remembered that October in Ohio can be punishingly warm—as in, summer temps—or we can have snow on the first weekend. We have been in a heat wave that should break later this week. But in the meantime, I had been assigned to a small room, on the second floor of the old retreat house, that had no A/C. As I trudged up the stairs with my bags I kept thinking, if it gets too bad, I can just go home. When I got into the room, I saw that there was a small desk fan on the table. I was very, very grateful. I was also grateful that the rest of the house—the lounge, the dining room, the chapel—were all abundantly air conditioned, and the doors to these spaces were left open so the A/C could sort of spill out all over the house. So, desk fans. Don’t leave home without ‘em when it’s hot. I love pasta, but I try to use it for “special occasions” these days—and the feast day of my patron saint counts! Delicious, and pretty quick. A good combination. Some days, a book stack is all I need to be happy. My grandma is down here with my aunts, spending time on a girls’ weekend together at Easton (A shopping/entertainment district near where I live). I didn’t know grandma was in town, so I was really pleasantly surprised to see her at Mass last night! A gorgeous, full rainbow when it was getting dark. The colors were AMAZING. It felt like Oz, almost. Really really cool. Today was a gorgeous fall day, crisp blue sky, little breezy—one of those days that just makes me happy. So I’m going to go take a bath and then read some of my library books and maybe watch opera? Because I have a ton of opera DVDs here from the library that I need to get working on. Ohio tends to get a bad rap. It’s boring, it’s flat, it’s a hot bed of drug use and terrible things and Rust Belt ghosts and all that. But I’ve lived here all my life, and I really do like it. I drove home from barre class with the windows down and great songs on the stereo and a gorgeous early fall day. Ohio has its good points.